In our latest interview Craig chats with Bernie. They talk about Headless Chickens, Flugel and our Coach Steph. Craig: So Bernie, is Uni where you got into Korfball, or had you heard of the sport before? Bernie: I hadn’t heard of it. I actually signed up for softball and ultimate Frisbee, and then one of my housemates grabbed me and said, “You’re quite sporty – we’re playing Korfball on Sunday morning do you mind coming along for moral support”. Nothing better to do on a Sunday morning, went along and loved it! You go to one session, score a few goals and go from there. Craig: You scored a few goals in your first session? Bernie: (Laughs) Very close. Lots and lots of shots! Craig: So what particularly did you like about Korfball? Bernie: Liked the social aspect, going for a drink after training. Like the competitive element – it is competitive but not violent. I like running around like a headless chicken! I had only been playing for about three months and we had the varsity against Cambridge. The defence won it, lobbed it forward. They tried to incept from the line and missed, so I tried a running in shot just inside our half. It was an abysmal fail, there is a great picture of me in mid air – you can’t even see the post! 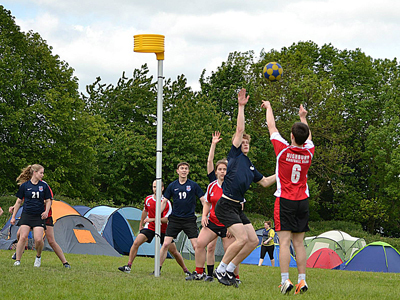 Craig: Was there something different to Korfball compared to other sports you tried at uni? Bernie: Mixed is a good part of it. If you’re single or want to get away from the whole ‘lad’ mentality. It’s a good sport for that. It’s a bit different, quite different to any other sport. Bernie: Oh no! How far back does it go? Craig: Well. Your first game on this is 2010/11. Oxfordshire Korfball league 2a and 2. So you’ve played 78 games. Do you want to guess how many goals you’ve scored? Craig: No in 78 games, you’ve scored 121 goals! Craig: That’s 1.6 goals a game. That’s better than Jo and definitely better than Mark! Bernie: You saw Mark’s attempt of a goal in Attila? Bernie: But I do think those stats are distorted slightly. When I played at Uni, the other teams in the league weren’t Uni teams, they were local teams. You’d come across a lot of 40 year olds who would try and keep up. They were fine in the first ½ and the second ½ they kind of just waved me on past them. Craig: Still, an impressive amount of goals! So, going back to Attila, what did you like about it best? Bernie: Liked going out, having to play with the sense of fun in the hall. On the Sunday Rich and I were the only ones to turn up. So we were having to wake random people up and asking would they play. They were like “We’ll play if we can wear our pyjamas and no shoes” – That’s fine! Please just come and stand on the court. We’re all very social and all get on. And we had a Flugel! Never had a Flugel before. Craig: What’s a Flugel for the benefit of people that don’t know? Bernie: Flugel is a weird Dutch drink. It’s in a small bottle and you un screw the cap stick it in your mouth and put the cap on your nose! We had a lot of Flugel. Craig: Some may say too much! So, Attila aside, are you used to more competitive Korfball as you play in the squad? Bernie: Yeah, Steph is very good, very passionate and has her way of doing things. Craig: That must be good though when you’re at that high level. You need it. Bernie: Yeah we’ve definitely improved, our defence has improved a lot. We’re only conceding 3-4 goals a game at times. Craig: You’ve been playing with a front-defence? Bernie: We always used to play it, but perhaps needed Steph to help really implement it. She always gets across you need to see the ball and the player. You get a lot of intercepts, puts a lot of pressure on the opposition. Craig: Do you think that’s the big reason why Highbury teams didn’t concede as much? Bernie: It’s that but then everyone is playing off the same hymn sheet. If everyone is doing it, then it works well. You can’t have one person not doing it. It sets a standard, the team can’t exploit one person who’s not doing it. Craig: Now that you have been there a couple years playing with the same guys, it goes without saying that you must be getting used to each other. Bernie: Yeah you do. It’s having a belief that you know where they’re going to be, what they are going to do. If you see Darryl coming in at the post you know he wants to shoot because he has a yard on his player but then you know you can shoot if he’s on the collect. All these little things. I think with me they know that I’ll run around like a madman. Always making you slightly better. Craig: So final couple of questions: Who is your Korfball idol? Bernie: Mo. As a man just like pure perfection on the field. His reach, jump ability, sneaky shots – cheeky player! Craig: Favourite moment of last year? Bernie: Rich’s shoulder off in Attila. So funny. With you, Mark and who else… Oh Meena! Craig: Yeah, Rich’s dance moves never fail to entertain! That was great, thanks Bernie.